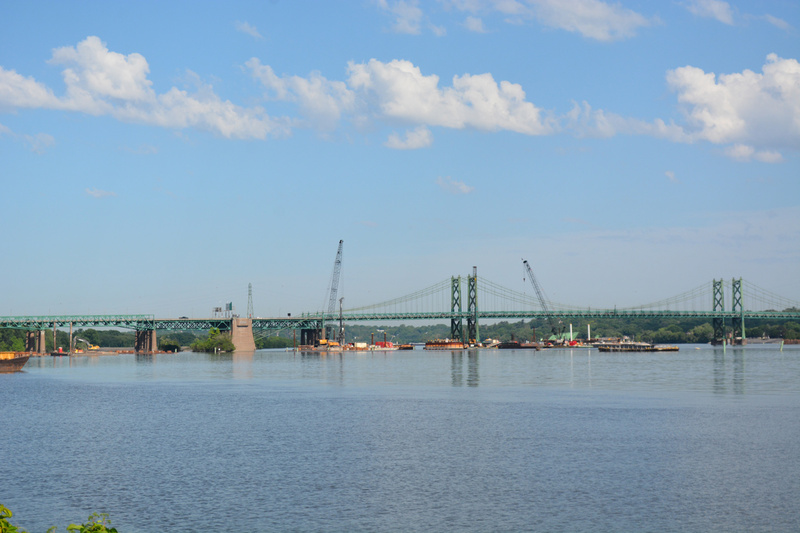 The Iowa-Illinois Memorial Bridge links Moline, Illinois with Bettendorf, Iowa across the Mississippi River. 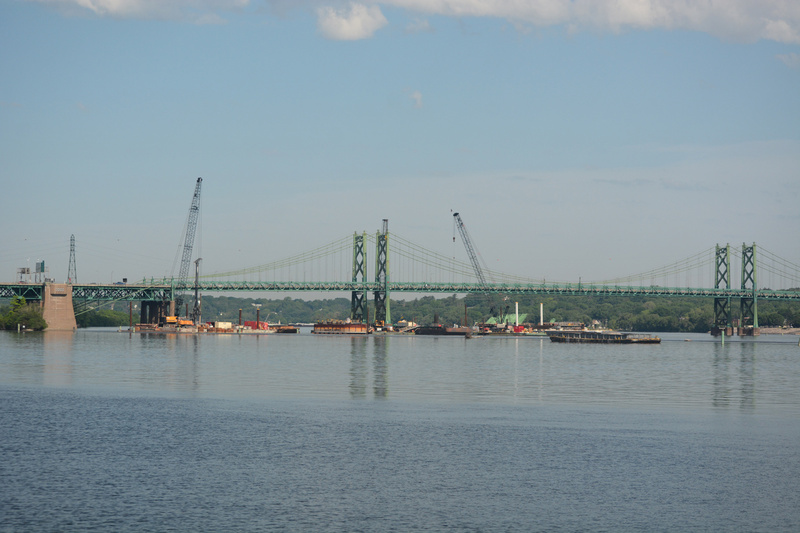 Construction started in July 2017 replaces the twin suspension bridges with a basket-handle, true-arch twin bridge. 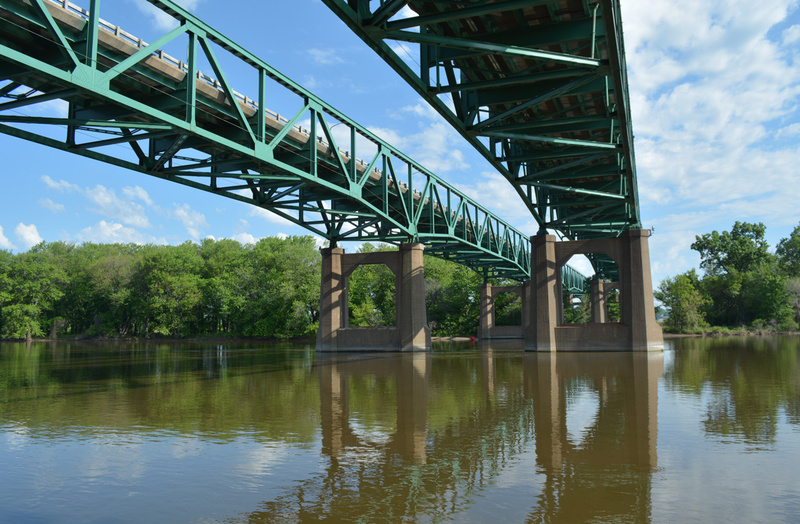 The new six-lane crossing will be completed in 2021. 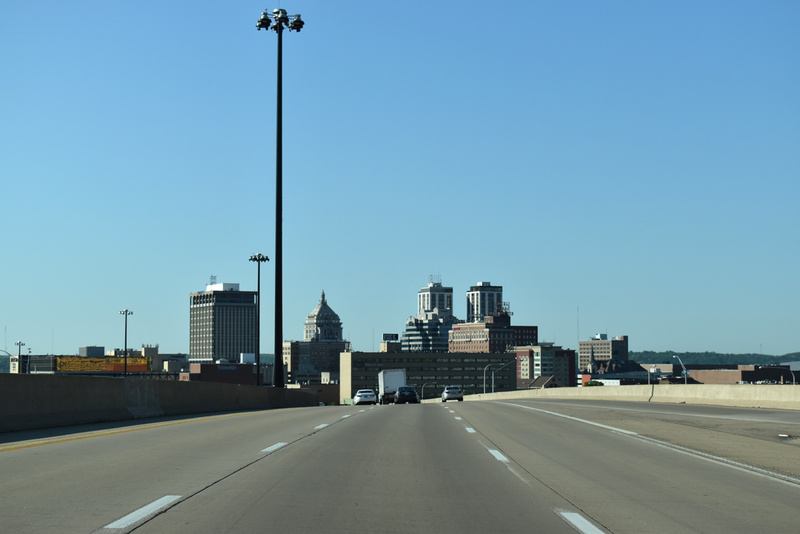 Interstate 74 joins the Quad Cities with Galesburg, Peoria, Bloomington-Normal, Champaign-Urbana and Danville along a 220 mile route across the north central part of Illinois. The freeway parallels U.S. 150 for almost its entirety across the state. I-74 enters the Land of Lincoln across the aging Illinois-Iowa Memorial Bridge over the Mississippi River. The freeway leaves the state through the industrial outskirts of Danville en route to Crawfordsville and Indianapolis, Indiana. A gently undulating landscape of farm fields represents the drive along Interstate 74 between Quad Cities and Galesburg. 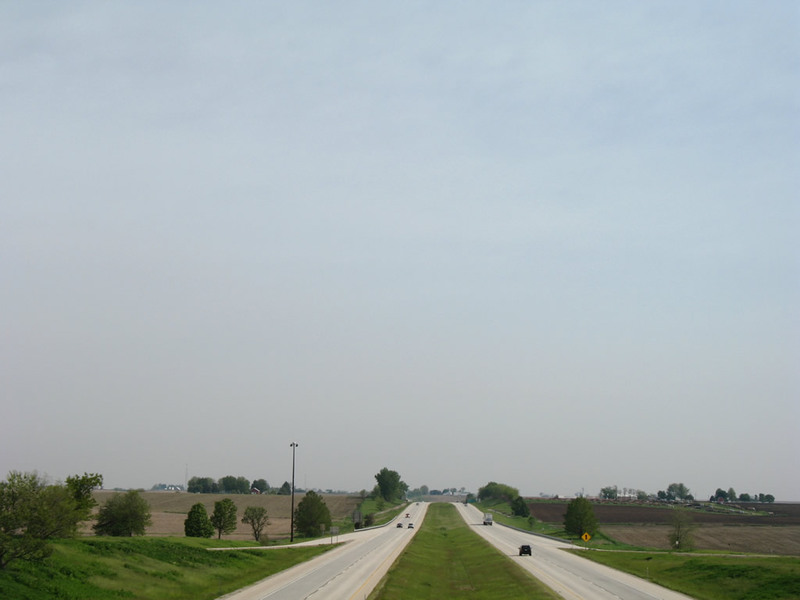 This view looks south from the Illinois 81 overpass at Exit 24. Photo taken 05/24/08. Construction between spring 2013 and October 2016 expanded Interstate 74 to six lanes from Pleasant Hill Road at East Peoria to Morton Avenue (Exit 102). 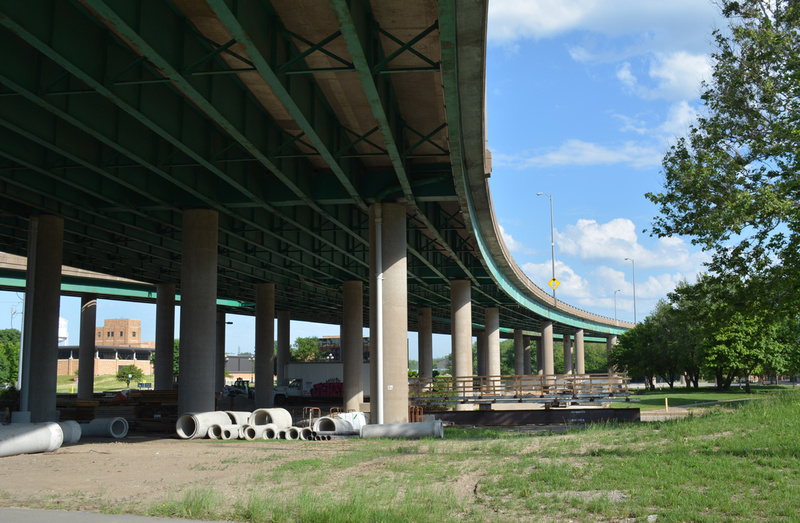 The $85-million project removed overpasses above an abandoned railroad just east of I-155, replaced the tunnels for Jefferson Street below I-74 with conventional overpasses, and reconfigured the trumpet interchange at I-155 with longer ramps. This included the construction of new overpasses for I-155 above I-74, which reversed the original setup. Work at Exit 102 rebuilt the six-ramp partial-cloverleaf interchange with the removal of the loop ramp (Exit 102B) from I-74 east onto Morton Avenue north. More information available at the IDOT project web site. What was the largest road project in downstate Illinois, Upgrade 74 rebuilt all of Interstate 74 from East Peoria through Peoria. The $490 million broke ground on Oct. 21, 20023 and ran through November 22, 2006 with a formal ceremony celebrating the project completion held at Riverfront Park on November 20, 2006.4 Landscaping work however continued through 2007. Work focused on the rebuilding of all Peoria interchanges to go along with expansion of the freeway to six and eight lanes wide. This included the addition of a system of tunnels added to link I-74 with Knoxville Avenue (IL 40).1 and a new flyover ramp from I-74 west to Illinois 40 (Washington Street) and the Bob Michel Bridge among other improvements. 7th Avenue meets I-74 & U.S. 6 at the south approach to the Illinois Iowa Memorial Bridge at a single point urban interchange (SPUI). 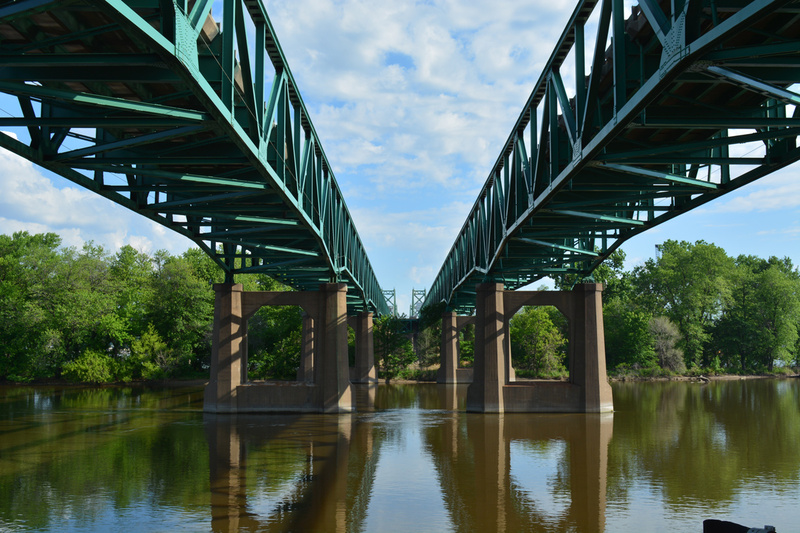 The new bridge will branch eastward from above 7th Avenue. Photo taken 03/12/17. A diamond interchange joins Interstate 74 with Avenue of the Cities in Moline. Ramps connect with parallel 19th Street in both directions. Photos taken 03/12/17. Fahey Hollow Road south at I-74 east and Pinecrest Drive south in East Peoria. Photo taken 05/24/18. Morton Avenue northbound at Bond Street and the entrance to the Morton Caterpillar plant. The interchange with Interstate 74 follows. Photo taken 05/24/08. 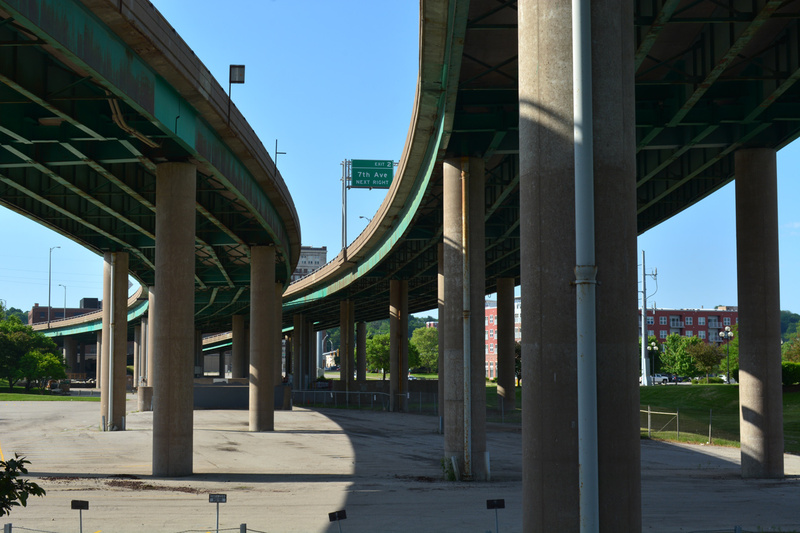 Two loop ramps lined the east side of Morton Avenue at Interstate 74 originally. The I-74 east to Morton Avenue northbound ramp was removed during 2013-16 road construction to improve I-74 west from here to I-155. Photo taken 05/24/08. A loop ramp joins Interstate 74 west from Morton Avenue northbound. Morton Avenue becomes a residential road north of Lakeland Road to a subdivision along Ackerman Creek. Photo taken 05/24/18. A trailblazer directs motorists from travel amenities along Ashland Street onto Morton Avenue south by the interchange with Interstate 74. Photo taken 05/07/10. Morton Avenue expands into a four-lane arterial through the parclo interchange with Interstate 74. I-74 leads west eight miles into Peoria from Morton. Photo taken 05/07/10. Approaching the left turn onto Interstate 74 east along Morton Avenue south. The eastbound on-ramp was shifted north to coincide with the realigned off-ramp during 2013-16 road work. 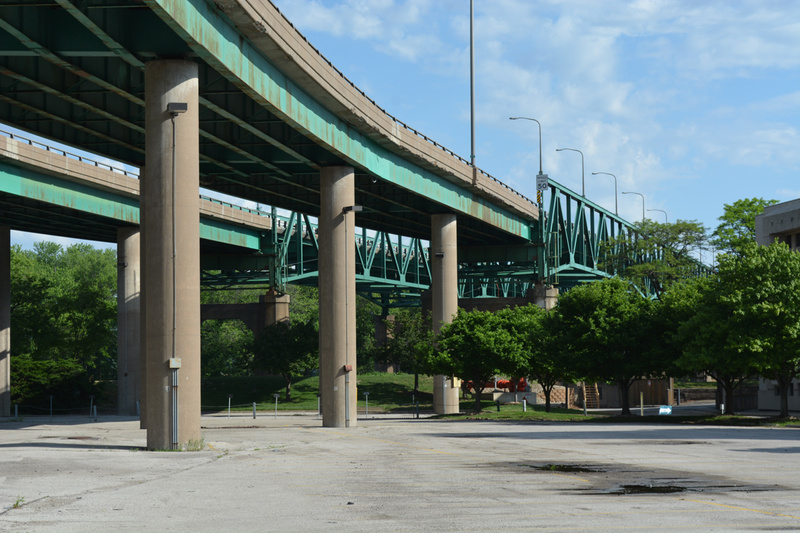 The loop ramp on the southeast quadrant was subsequently eliminated. Photo taken 05/07/10. Interstate 74 proceeds east 25 miles from Morton to merge with Interstate 55 south at Bloomington. Photo taken 05/07/10. Illinois 130 (University Avenue) ends in Urbana at the interchange with Interstate 74. Here, the local control cities of Bloomington and Danville are used. Photo taken 08/19/10. "THE BIG FIX -- First year at-a-glance." The Peoria Journal Star, June 22, 2003. "Full speed ahead - Upgrade 74 : By the Numbers." The Peoria Journal Star, November 12, 2006. "I-74 works means new rules - It's I-74." The Peoria Journal Star, November 20, 2006. "Brighter signs going up on I-74." The Peoria Journal Star, October 12, 2006. "Piece of I-74 bridge donated to society - Murray Baker Bridge strut will be put on display." The Peoria Journal Star, May 17, 2005. 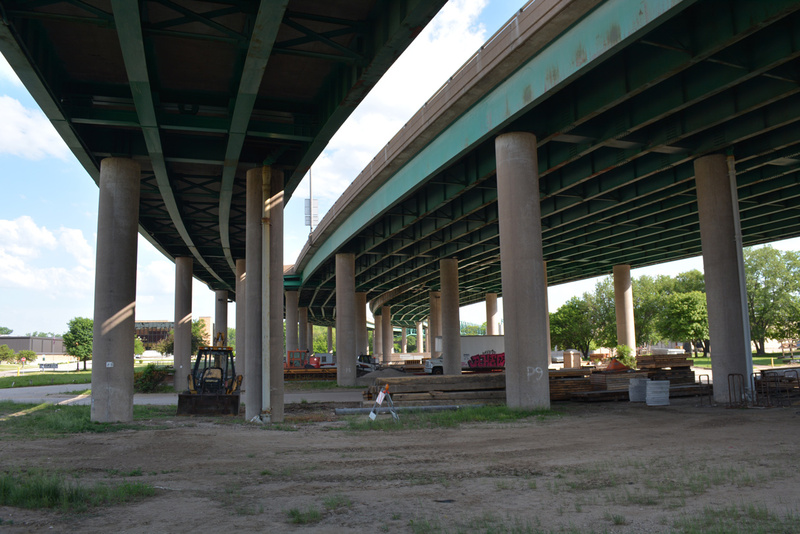 "Cause for celebration - Festival will mark historic I-74 construction and reopening of Murray Baker Bridge." The Peoria Journal Star, September 29, 2005. "ROAD TO CHANGE>BUILDING INTERSTATES." Journal Star, June 30, 1996. 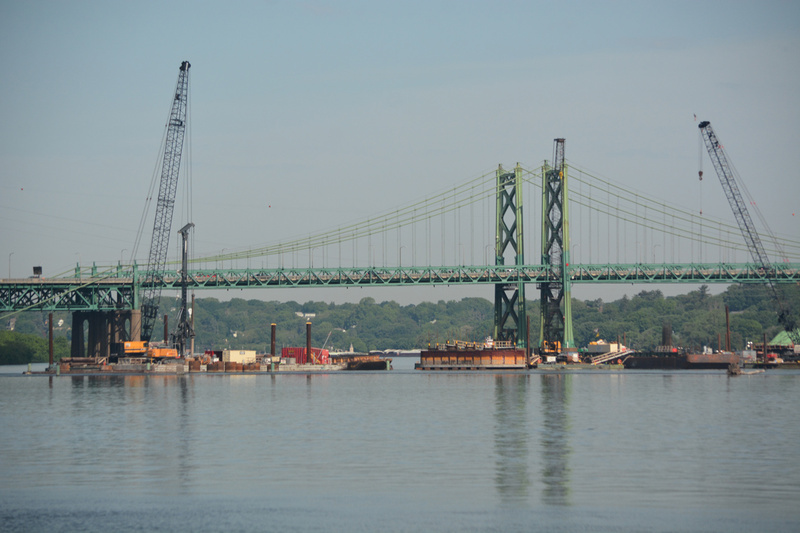 "Photos: Building the Murray Baker Bridge." Journal Star (Peoria, IL), July 12, 2018. 03/12/17 by AARoads and Bill Gatchel.